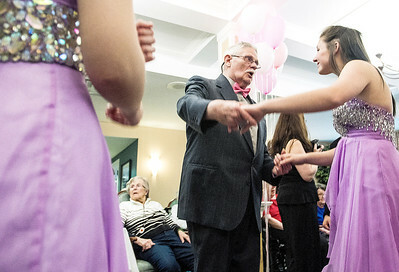 Sarah Nader- snader@shawmedia.com Maddie Warder (left), 17, of Cary dances with Richard Selcke during a senior prom at Three Oaks Assisted Living in Cary Thursday, May 5, 2016. High school girls in the Miss Cary-Grove scholarship pageant and two teens from Alexander Leigh School of Autism participated in the senior prom. Sarah Nader- snader@shawmedia.com Alexander Leigh School of Autism student Dena Skinner (center), 17, of Vernon Hills dances during a senior prom at Three Oaks Assisted Living in Cary Thursday, May 5, 2016. High school girls in the Miss Cary-Grove scholarship pageant and two teens from Alexander Leigh School of Autism participated in the senior prom. Sarah Nader- snader@shawmedia.com Students in the Miss Cary-Grove scholarship pageant Allie Remmer (left), 18, Ally Ehlers, 16, and Emily Schladt, 17, perform the Y.M.C.A. for residents during a senior prom at Three Oaks Assisted Living in Cary Thursday, May 5, 2016. 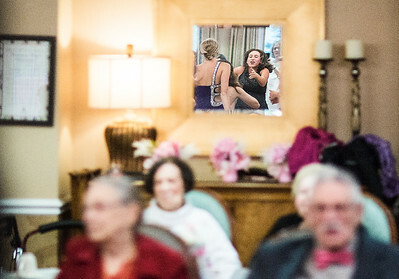 Sarah Nader- snader@shawmedia.com Jenny Rice (left), 18, of Cary dances with Betty Hooper during a senior prom at Three Oaks Assisted Living in Cary Thursday, May 5, 2016. Sarah Nader- snader@shawmedia.com Ron Doerr (left) dances with Colleen Kaveney, 17, of Cary during a senior prom at Three Oaks Assisted Living in Cary Thursday, May 5, 2016. 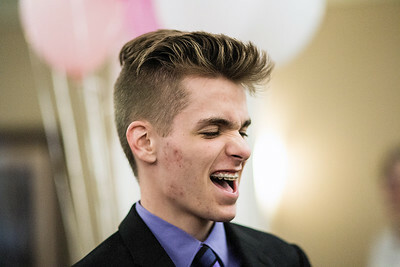 Sarah Nader- snader@shawmedia.com Joey Walsh, 17, of Cary sings to the music during a senior prom at Three Oaks Assisted Living in Cary Thursday, May 5, 2016. Sarah Nader- snader@shawmedia.com High School girls in the Miss Cary-Grove scholarship pageant dance to the music while residents watch during a senior prom at Three Oaks Assisted Living in Cary Thursday, May 5, 2016. 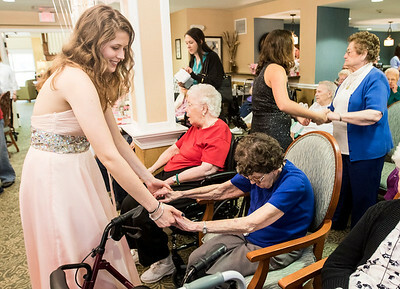 Sarah Nader- snader@shawmedia.com Alexander Leigh School of Autism student Dena Skinner (center), 17, of Vernon Hills dances in a conga line during a senior prom at Three Oaks Assisted Living in Cary Thursday, May 5, 2016. 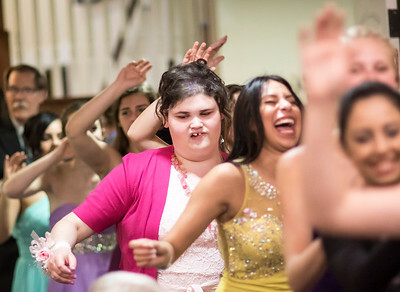 High school girls in the Miss Cary-Grove scholarship pageant and two teens from a=Alexander Leigh School of Autism participate in the senior prom. Alexander Leigh School of Autism student Dena Skinner (center), 17, of Vernon Hills dances in a conga line during a senior prom at Three Oaks Assisted Living in Cary Thursday, May 5, 2016. 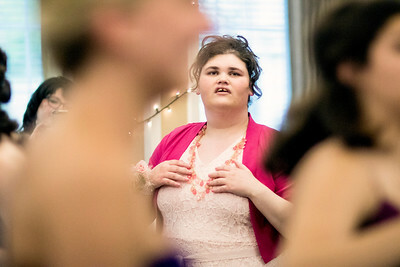 High school girls in the Miss Cary-Grove scholarship pageant and two teens from a=Alexander Leigh School of Autism participate in the senior prom.